In loving memory of our Dad, Duncan Scowcroft, we are hosting the 2nd Duncan Scowcroft Golf Classic to raise money for Southlake Regional Health Centre. 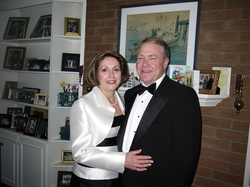 After a short battle with stomach cancer, we lost our Dad, June 18, 2010. He had been a patient at Southlake. The care he received from the nurses and doctors at Southlake was phenomenal. Although they were not able to save Dad’s life, they did provide wonderful care and allowed him his dignity in his final days. We miss our Dad every day and raising money for the hospital is our way of celebrating Dad’s legacy. The proceeds from our event will be used to purchase much needed equipment & supplies for the hospital. The 2nd Duncan Scowcroft Golf Classic in support of Southlake Regional Health Centre took place on Saturday July 11, 2015 at Wooden Sticks Golf Club. Thanks to all of your support, we raised $10,735 for Southlake! THANK-YOU! The first Annual Duncan Scowcroft Golf Classic took place June 2011 and was a huge success! It raised $11,232 for Southlake! This means, when you combine both tournaments, the Duncan Scowcroft Golf Classic has raised $21,967 for Southlake! As part of the fundraising event, we will be hosting a silent auction. Click here for a list of some of the silent auction items. We will be accepting cash and cheques only. Thank-you Snapd Stouffville/Uxbridge for including the 2nd Duncan Scowcroft Golf Classic in the August edition of the newspaper! Click here to read the article. Thank-you Snapd Newmarket for including the cheque presentation to Southlake in the August edition of the newspaper! Click here to read the article. Thank-you to APEXX GLOBAL and APEXX TRAVEL for supporting the 2nd Duncan Scowcroft Golf Classic! 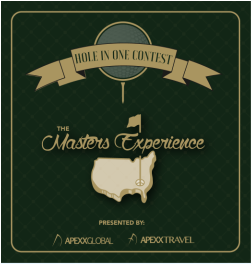 Get a hole in one and win a trip for two to the Masters in Augusta!